NORCROSS, GA--(Marketwired - Apr 28, 2014) - RayBiotech, Inc. ("RBI") announced today that it has partnered with XCellCure, LLC ("XCellCure") to develop a proprietary cardiovascular disease diagnostic kit. Under the terms of the partnership the companies will co-market and co-distribute the kits worldwide, first for research use with the long-term goal of its implementation in clinical diagnostics and prognostics applications. The financial terms were not disclosed. 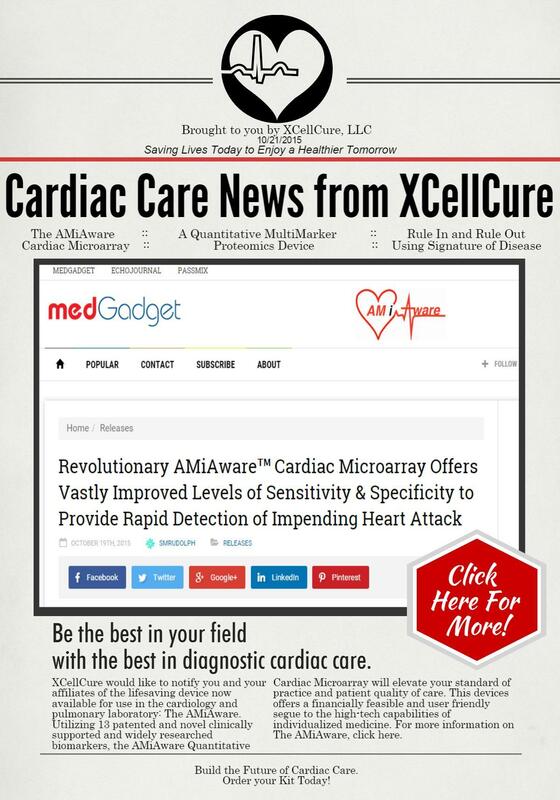 Leah Amir, MS, MHA, CEO of XCellCure, stated, "We are delighted to have partnered with RayBiotech for the development of this kit, which provides for both thorough and accurate detection of early events leading to cardiovascular disease and related acute myocardial infarction (AMI). Our proprietary CV disease risk biomarkers combined with RayBiotech's unique and cutting-edge antibody array technology has resulted in a revolutionary kit for diagnosing CV disorders at even the earliest of stages." Commenting on the agreement, RayBiotech's President, Chief Operating Officer and Co-founder, Ms. Rani Huang, stated, "XCellCure and its team has defined some of the most comprehensive and accurate biomarkers for diagnosing cardiovascular disorders to date. We believe that combining XCellCure's biomarkers with RayBiotech's antibody array technology now allows for the most sensitive and accurate way to diagnose cardiovascular disease and its related disorders. We are pleased to have worked closely with XCellCure scientists and management to develop this next-generation cardiovascular disease diagnostic kit." With XCellCure's management team having over 35 years of experience improving the delivery of healthcare in the U.S. and worldwide they decided it was time to give clinicians the tools they need to improve treatment decisions. XCellCure is on a mission to improve the quality of healthcare available to people worldwide by delivering cost effective, novel, lifesaving medical products so we may all live healthier lives requiring less dependence on the medical system. XCellCure welcomes the opportunity to partner with Raybiotech -- a pioneer in developing complex microarrays with diagnostic accuracy aimed at improving clinical decisions. Through XCellCure's exclusive licensing agreement with researches at Leiden and Maastricht Universities in the Netherlands, XCellCure offers the first diagnostic multiplexed microarray kit able to prognose and to diagnose an acute myocardial infarction, before the onset of irreversible heart tissue damage. XCellCure can be reached at 877-997-3360 or by going to their website at http://www.xcellcure.com.